As a digital marketer, you can often be overwhelmed with the amount of information and data needed to be analyzed in order to evaluate your efforts. Traffic, conversion rate, user location, behavior and acquisitions — just to name a few — all have to be examined to define the progress of your digital marketing campaign. Client reporting is one of the biggest challenges digital marketers face when undertaking projects. Although endless numbers and stats may make some sense to internet professionals, generally customers are not as tech savvy. Anyone can export masses of information from Google Analytics to an excel spreadsheet, but how do you present the data in a way that’s easy to digest? 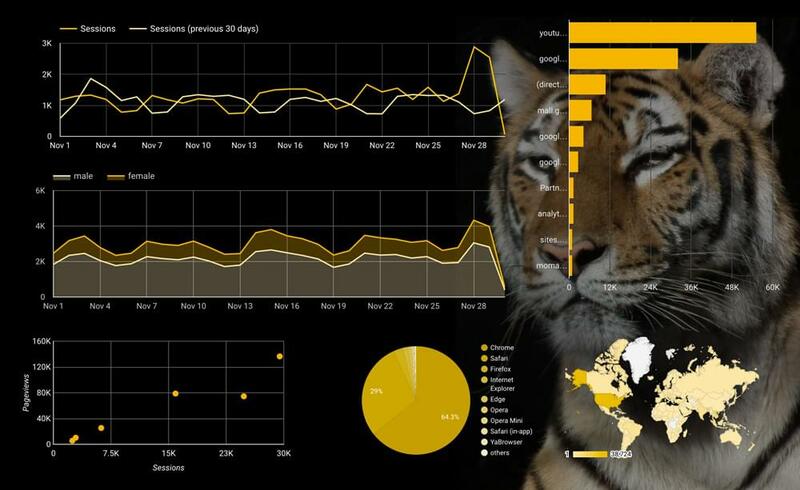 The answer is — Data Visualization. 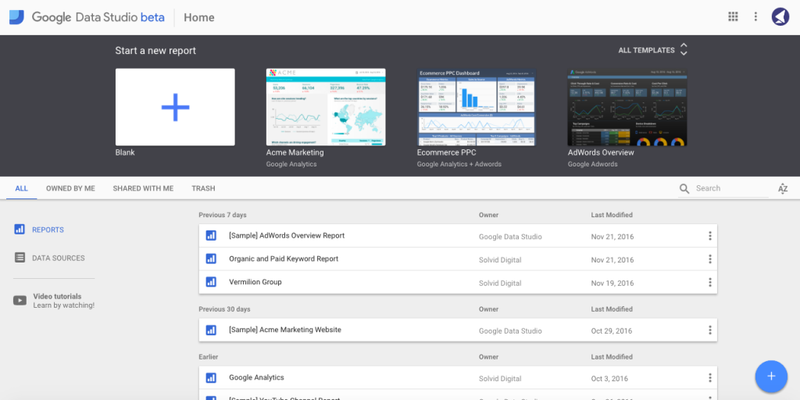 In this post, we’re going to assess how a new tool, Google Data Studio, can help us build beautiful and interactive reports. 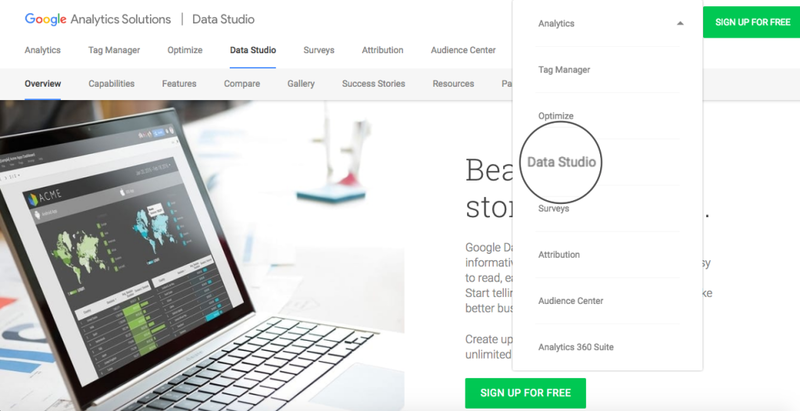 For this article, we’ll be using Data Studio to create a visual report using Google Analytics data. To do this, you first need to have an active Google Analytics property that is properly integrated with the website. 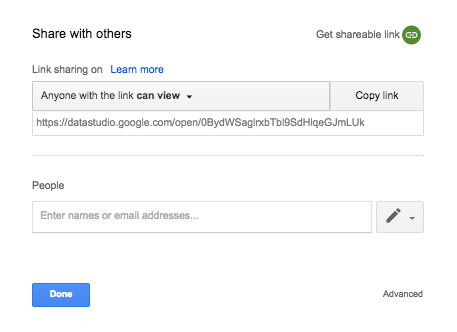 The following 18 steps will walk you through the process of creating a visual report from your Google Analytics data. This page is a primary control panel for your GDS projects. Here you can choose a pre-designed template, create new reports from scratch, add new data sources, manage your existing projects and watch video tutorials. One thing to note here is that, with the free version, you can only add up to 5 custom reports. All reports start with adding a data source. In other words, providing GDS with access to the information that’s intended to be used in the report. You’ll then be directed to the screen with the list of already connected data sources. To add a new one, click on the blue “Add” (+) button. Next, you’ll be bombarded with the following screen, which, at first, may seem quite challenging to digest. However, it’s not as horrifying as it looks. In simple terms, this is just a list of metrics and dimensions available to be used in the report. Each field is assigned a unique type: Numeric, Text, Date & Time, Boolean, Geo or Currency. 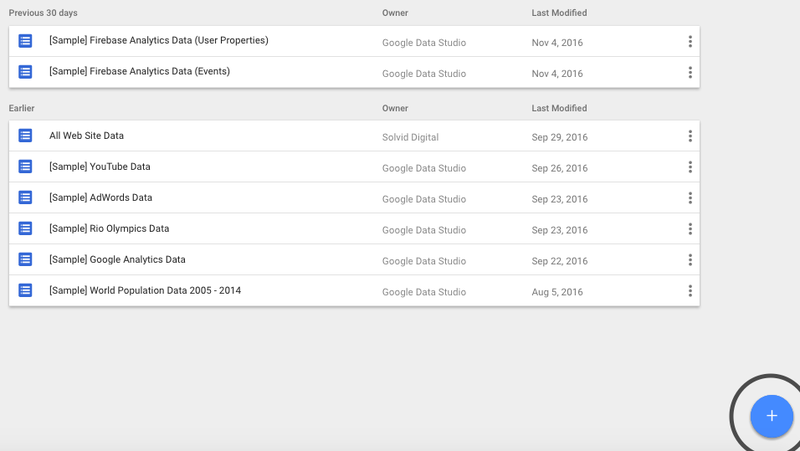 When pulling data from Google’s properties (such as Google Analytics or Adwords) GDS will assign the value automatically. However, if you’re using custom data pulled from an Excel Document, you’ll have to ensure that every field is assigned an appropriate type. 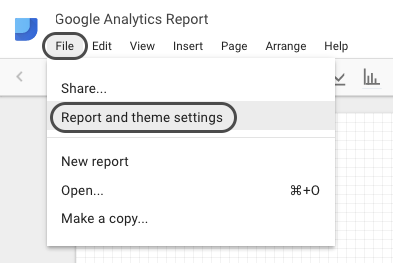 In this instance, you wouldn’t need to change any fields, so it’s safe to go ahead and click Create Report in the right-hand corner of the screen. 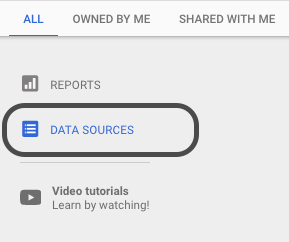 As soon as you connect the data source with the report, you’ll notice a control panel at the top of the canvas. 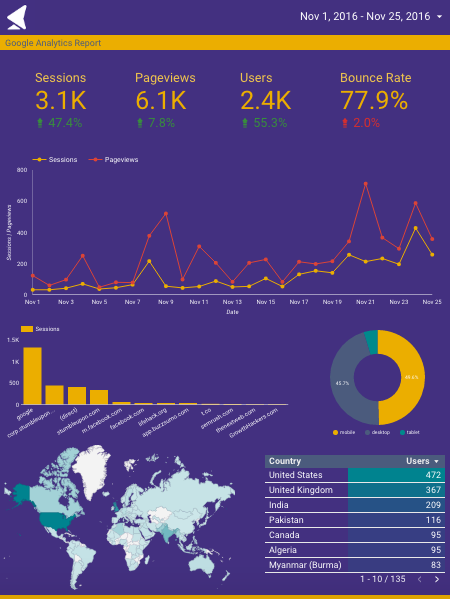 Currently, you can add the following components to your report: time series, bar chart, pie chart, table, geo map, scorecard, scatter chart, bullet chart, area chart, text, image, rectangle, circle, date range and filter control. However, in this guide, we’ll be using portrait orientation. Now that we have our canvas ready, let’s proceed with adding some branding and custom styling. Chances are, you’re creating these reports for clients. Hence, custom branding is an essential part of making your reports visually appealing. Let’s add a header by using the rectangle tool. Select the area where you want your shape to appear. Let’s go ahead and add a logo to our report. Click on the image tab as shown below and select the area where you want your logo to appear. Then, hit the Data tab in the right sidebar and select an image file. What’s fascinating about Google Data Studio is that it allows adding an interactive date range, which will automatically change the graph data according to the date range. Once we have the basics ready, we can proceed with further styling and adding the actual data to our report. Let’s start off with some general score cards. A score card is simply a single metric that can be used to represent some general information, such as total visitors, total sessions, bounce rate, etc. We’ll now proceed with adding four score cards, representing sessions, pageviews, users and bounce rate. First, go ahead and add a score card using the tab as shown on the image below. You can then copy and paste this score card, changing the metric source. It’s now time to add a first graph that will represent a number of sessions and pageviews for our selected date range. Let’s now add a bar chart representing session sources. We can now add a pie chart representing a breakdown of sessions by devices (that is, desktop, mobile and tablet). Last but not least, let’s add a geographical map and table of users. Click on Geo Map, select Country ISO Code from the dimensions list, and select users from a list of metrics. Now that we have everything ready, it’s time to go ahead and share this report with our colleagues or clients. Tap the Share button in the top-right corner of the screen. 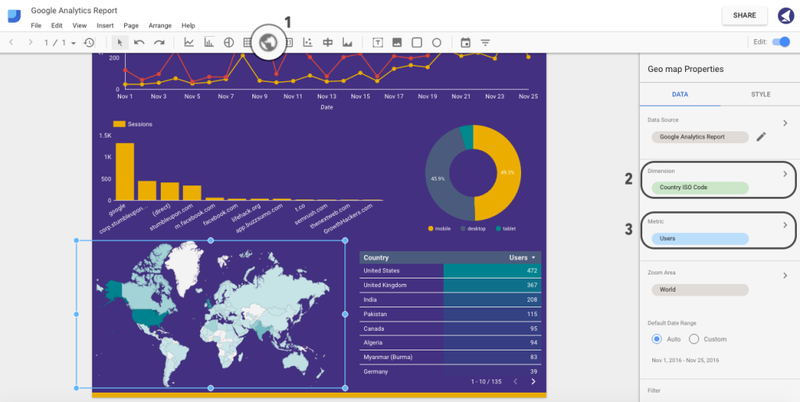 Hopefully, after reading this guide, you now have an idea of how important and powerful data visualization can be, and how to incorporate Google Data Studio to provide your clients with comprehensive, easy-to-understand interactive reports. We’d love to hear your thoughts and any experiences you’ve had with this tool. Dmytro is a Head Wizard at Solvid, an Inbound Marketing and Software Development Agency in London, UK. An author for a wide range of publications, he is also currently developing an advanced, user-friendly Q&A platform for web developers, inbound marketers and software engineers.